Newshub reported that there were “at least 50”, TVNZ said there were “hundreds”, and one of the the organising groups thought they counted 400 people protesting in Auckland. In reality, approximately 150 people gathered in Aotea Square in Auckland to protest against the United States’ acknowledgement of Jerusalem as Israel’s capital and its decision to move its embassy there. Children were lined up holding signs reading “Free Palestine” and “Jerusalem is Palestinian”. One little girl was given a microphone and read a speech in which she claimed that “Jews say they’ve been in Palestine for 2,000 years but have no proof. Palestinians have been in the land for 7,000 years and have all the proof.” This is as ahistorical and counter-factual as saying Jerusalem is not Israel’s capital. The other speakers were even less interested in history or Jerusalem. Mike Treen, National Director, Unite Union, spoke about “defeating Israel” by making it a pariah state; Billy Hania, Palestinian Solidarity Network spokesperson, told the crowd that Israel enjoys bombing babies in Gaza; and Roger Fowler, founder of Kia Ora Gaza and Palestine Human Rights Campaign, proposed a “resolution”, calling on the New Zealand government to close the Israeli embassy in Wellington. “Where is the Arabic nation? Where? Jerusalem is ours and not the Zionists. While you would be hard-pressed to hear it in the New Zealand media, the decision to move the US embassy to Jerusalem is not a new policy – it has been in US legislation since 1995 but was waived every six months by successive presidents due to national security concerns. President Trump has also been more nuanced than Obama, Bush, and Clinton, in his language by not referring to an “undivided Jerusalem” and making it clear that negotiations are the only way to solve the dispute over the territory Israel took from Jordan in the 1967 war, when Israel’s neighbours sought to destroy her. 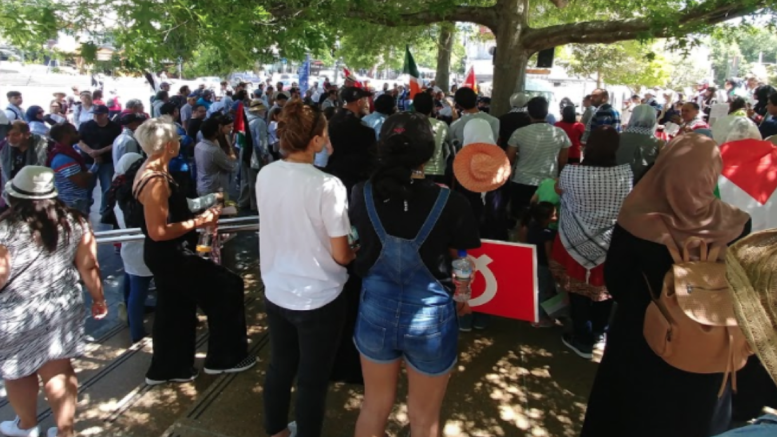 But negotiations are not what the anti-Israel protesters were after, with most speakers calling on the New Zealand Government to condemn an announcement that simply recognises fact. It seems as if Prime Minister Ardern and Foreign Minister Peters also failed to understand the nuance in President Trump’s announcement. Ms Ardern said that the status of the contested city should be decided as part of wider efforts to resolve the conflict between Israel and Palestine. Unless she considers territory West of the 1949 armistice line “contested”, she hasn’t listened closely to the US statements. The Prime Minister’s statements about the US announcement hindering peace are also inconsistent with her silence over condemnation of resolution 2334. This resolution was a unilateral action by an outside party which sought to pre-empt the final outcome of negotiations. UN Resolution 2334 discriminated against Israel by designating Jerusalem’s Temple Mount and Western Wall, the holiest sites in Judaism, together with the Jewish Quarter as “Occupied Palestinian Territory”, without recognising the Jewish connection. The resolution also over-rode the Oslo Accords by re-defining the 1949 Armistice Lines as final borders, while the 1967 cornerstone resolution 242 deliberately refrained from doing so. The only consistency from the New Zealand government is a lack of condemnation of Palestinian terror. In fact, Palestinian leaders’ calls for “days of rage” and the violence that ensues are implicitly condoned by the New Zealand government’s silence. Resolution 2334 also failed to explicitly mention Palestinian terror but Foreign Minister Peters seems to disregard any United Nation resolution more than 1 year old. When questioned by Radio NZ as to whether he agreed with the substance of UN Resolution 2334, he replied that the resolution “is something that happened a long time ago – about one year ago now – so it’s really academic.” Perhaps that’s the right approach to an organisation with such bias.